VILLAS AND APARTMENTS TO RENT IN CALABRIA, ITALY. Welcome to our selection of holiday homes to rent in Calabria, Italy. Calabria is located right in the �toe� of the boot of Italy, close to Siciliy and surrounded by the sea on three sides. Unsurprisingly for an area that is so close to the Mediterranean, Calabria is well known for its seaside towns and beaches, many of which have an interesting history, as well as somewhere pleasant to soak up the sun. The countryside is ideal for those who enjoy hiking or mountain biking, even though the temperatures in the summer months can get too high for any kind of exercise! There are resorts all around the coastline of Calabria, some with views over the Strait of Messina to Sicily. One of the most popular is Tropea, on the Tyrrhenian Sea, home to a historic religious sanctuary, as well as an impressive beach backed by high cliffs. Also on the Tyrrehenian Sea, the small town of Pizzo is more famous for the dessert �tartufo� that was invented here, but it also has a pleasant old quarter and some attractive, smaller beaches. Sybaris on the Ionian Sea has stretches of sand to relax on, and is only a short distance from the fascinating excavations of a 7th century BC Greek colony. Finally, Soverato is the busiest of all Calabria's seaside towns, offering visitors not only a choice of beaches, but a lively promenade area and lots of nightlife in the summer. Although Calabria is only really a narrow strip of land at the southern point of Italy, you can still head inland to explore the more rual and mountainous areas. One of the most intriguing is Catanzaro, located at the centre of Calabria's narrowest point, with views of both the Ionian and Tyrrhenian Seas. There are dozens of excavations in this area, many of which have been left half-finished and unattended through a lack of time, allowing walkers to clamber through ancient Roman and Greek buildings. There are three main mountain ranges; the Aspromonte in the south, which are home to several inland lakes, the pine-covered Pollino mountains in the north and La Sila which runs down the centre of the region and is where Calabria's highest point can be found, if you fancy a walking challenge. The area's main town is situated right in the toe of Italy, at the closest point to Siciliy. Reggio Calabria is home to several museums, mainly displaying local archaelogical finds and the story of this ancient region while the old town itself is pleasant. 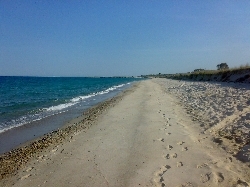 There are even a few beaches in this part of Calabria if you need to relax. You can also take a ferry or a tourist boat across the Strait of Messina to Sicily for an interesting and unique day trip. Looking for self catering holiday accommodation in Calabria? Then below is a selection of Apartments in Calabria and villas in Calabria that can be rented direct from their owners. You can either click on each listing for further details or you can use our search engine on the left if you are looking for something in particular.